Michael Higgins handily won a second term as Ireland's president Saturday, capturing every constituency in an election that was marked by low turnout. The 77-year-old Higgins received 55.8 percent of the vote in Friday's vote, which was contested by six candidates. The vote share was just below the record 56.3 percent received by longtime independence leader Eamon de Valera in a two-way contest in 1959. 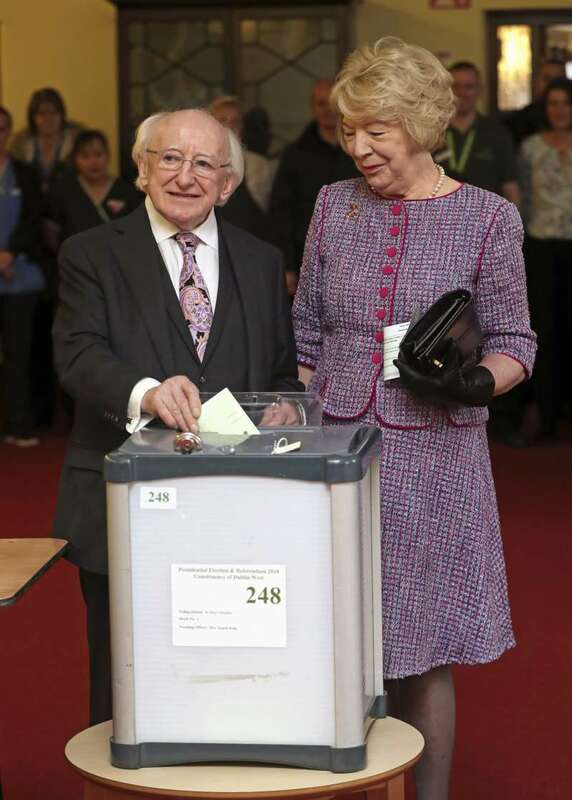 "The presidency belongs not only to any one person but to the people of Ireland," Higgins said after arriving at Dublin Castle with his wife Sabina. "I will be a president for all the people, for those who voted for me and those who did not." Voters also overwhelmingly backed removing the offence of blasphemy from the Irish constitution. It was the latest in a series of measures that have seen the overwhelmingly Roman Catholic country step back from the religion's influence over government. The vote was controversial only in the second-place finish of businessman Peter Casey, who won 23.3 percent of the vote after making critical comments about the Traveller community, a traditionally itinerant ethnic group, and asserting that Ireland has a culture of welfare dependency. Casey's support had been as low as 1 percent before the comments but surged after. Casey said he was advocating for "middle Ireland," people who are struggling to pay bills and get on the housing ladder. "The real reason I got a bump in the polls is because I spoke out and said middle Ireland," Casey said. "They are the people who are hurting, they are the people who got nothing out of the last budget and they are the ones who are paying all the bills." Ireland's president is head of state, but his job is largely ceremonial in the parliamentary democracy led by Prime Minister Leo Varadkar.